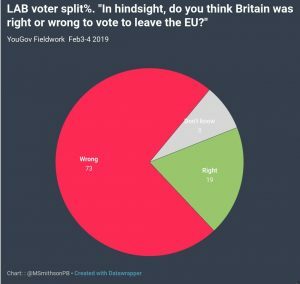 So why are Labour members & supporters letting their party leadership back Brexit? Just 17% Approve of him – 72% Disapprove – That’s a score of minus 55! The two have to be linked, don’t you think? Yes, we all understand that Corbyn is a life-long anti-EU person because he thinks it’s some kind of capitalist conspiracy yet by enabling Brexit he is actually helping the far-right to get their way and trash our economy, living standards, employment rights and much else. The big question is why are Labour members & supporters letting their leadership get away with doing the exact opposite of what they believe to be right? I understand that loyalty to The Party is everything in the Labour Party and that it goes back all the way to the trade unionists who founded it but Brexit is putting at great risk many of the advances that the trade union movement has fought for and won! Sitting back and letting the present Labour leadership have its way is akin to Labour members and supporters voting for UKIP and far-right Tories for goodness sake. What’s the point of being loyal to The Party if all you are doing is helping the far-right? As a life-long trade unionist and someone who considers themselves to be well to left on the spectrum of UK politics I despair, I really do. That politicians call each other by such vile language (who are in the same political party!) says a lot about the current state of our politics. But hey Labour politicians have been calling each other similar and worse than what Teresa May is called by her own tribe for a long time now. The lies told about Brexit are at the heart of most of our political discord these days and the fact that our two major parties have gone off towards political extremes. Once a party goes to extremes it finds its lovers and its haters both within and outside that political movement. There’s is no room for people of moderate views in either the Tory or Labour Party of 2018, indeed the ruling sects of the two parties want the moderates out and they hate those moderates as much if not more than opposition politicians. It always seems worse when women are at the sharp end of party political abuse because generally they are far less likely to throw out such abuse at others. In Teresa’s case her party is now of the far right and UKIP-type people are the dominant and uncompromising voice. She however was once an EU Remainer and despite that fact that she’s now trying to sell herself as a Brexiteer the real Brexiteers don’t trust her as far as they can throw her. They are mainly the rich and powerful and they see her as weak; trouble is most folks see Teresa as weak too! Her ‘peace in our time’ approach is not buying them off and it never will do. Whether it be Momentum/Militant or UKIP/Fascist they deal in utterly uncompromising politics and when people get in their way, who are not of their sect, then the outcome can hardly be a surprise no matter how distasteful it may be. Yes of course Momentum is tightening its grip but on Merseyside, as it’s doing across the Labour Party, but they are known as Militant to Scousers. But let’s look beyond the headlines, the questions being are Momentum becoming more Militant or are Militant gaining Momentum? It seems as though some on Merseyside are now looking back at the 1980’s with very rose tinted spectacles on. It was not a good time for Liverpool but Militant made it worse with their political posturing and false hope. Yes it was some 30 years ago so many who want to celebrate the return of the far left will not have had any experience of that era. Indeed, their knowledge of it will have come from those who do remember it or those who were a part of it. I also understand that some Labour MP’s on Merseyside may not be all that comfortable, especially those with longer memories. By the way don’t get too carried away with Frank Field MP resigning the Labour Whip. His case is more of a unique nature because of his support for Brexit, which seems to go beyond that of even the Labour Leadership in Westminster and that takes some doing. A good starting point for anyone wishing to get their heads around Liverpool City Council or the Labour Party on Merseyside is to visit the blog site of former Labour MP for Walton Constituency Peter Kilfoyle. If you remember he was Neil Kinnock’s man in Liverpool when Militant were being driven out of the Labour Party. The Lib Dem Group Leader on Liverpool City Council, Cllr. Richard Kemp, is another blogger on the local political scene who lived through the Militant era, in his case as a Liverpool City Councillor. Both of these men have the scars and knowledge of how Liverpool, from the management of public services perspective, simply fell apart at the seams under Militant. Neither have rose tinted spectacles I might add. So is Liverpool really slipping back towards the political mismanagement of the 1980’s? At face value it seems to be doing just that. Labour in the City is already riven with splits of both a political and personal nature. That you will oft hear of a Labour faction calling another Labour faction ‘a gang of Tories’ or words that effect says it all does it not? From a wider perspective my feeling is that Liverpool has always been a tough place to govern and that everyone who has tried to do it has eventually ended up with burnt fingers. Maybe this is not unusual for a large city council? In my years as Leader of neighbouring Sefton Council (and these coincided with good years for the City of Liverpool) you often got the impression that the City Council was pretty much on the edge and that power struggles within it were always about to erupt. But despite this underlying instability within the City Council it still wanted to be the boss on Merseyside and it got very frustrated with the surrounding Borough’s that were often less than keen on whatever its latest initiative was. That Merseyside politics has traditionally been seen as dysfunctional by governments of all colours over the past 30 to 40 years is a given but to me the City Council and its inability to be at peace with itself, let alone with it’s family of local government neighbours in the now called ‘City Region’ is at the heart of these difficulties. My guess is that Liverpool City will always be a political melting pot which attracts those with both radical (I use that word in its widest terms not just in the Liberal sense) and off the usual scale views. It will also pull in those who want power because they feel that their vision for the City is the right one whether it sends the City to hell in a hand cart or not and it’s the Labour Party that they usually subscribe to. Should Liverpool end up is some politically dark places again under Labour then the reality is that few will be surprised. Oh and one last point, on becoming leader of Sefton Council I was asked by a senior officer, somewhat tongue in cheek obviously, ‘what’s your most important task as leader of the council?’ I thought about it but before I could answer I was advised it was to keep Sefton out of the Rotten Boroughs column of Private Eye. As a reader of Private Eye I wonder whether the leading lights on Liverpool City Council have in recent times been advised the very opposite to me? The Guardian has this interesting piece on its web site. That Labour is ‘suffering’ another period of entryism akin to that it had ‘trouble’ with in the 1980’s (Militant) is a given. But entryism and the radical changing of direction of political parties is nothing new although Labour in particular does seem have periods where what it believed in yesterday is no longer what it believes in today more often than other parties. It’s social democrat and hard left wings seem to be in continual battles to be top dog you might say. But if you look at the Tories now they are nothing like the political party of Heath or even Major. Often now referred to as ‘Bluekip’ and at times leaning worryingly towards fascism is it not reasonable to look upon all those UKIP supporters and activists joining and voting Tory as entyists too? And then there was the Clegg period running the Lib Dems. Apart from that period being an utter disaster for the Party there were what seemed to be very genuine fears amongst the party membership and indeed the electorate that what had been a genuine party of the center left under say Kennedy, Grimmond etc. had been hauled over to the right, certainly in economic policy areas. Not quite entryism but a significant and truly unwise experiment which may well take years to ‘wear off’ with left leaning liberal voters. So policy lurches in political parties are nothing new as there are other examples across all the main political parties if you delve into their pasts. However, is what is happening within Labour of far greater significance? I ask as the process within the party under Momentum does seem to be much more far reaching. Not so much Labour gathering Momentum but Momentum gathering Labour. But is there anything fundamentally wrong with Momentum, if they are the dominant creed within Labour these days (and we assume they are), demanding loyalty to their policy agenda before Labour candidates are selected/reselected to fight elections for the party? There seems to be a logic to that argument to me, although it does significantly change what Labour have often referred to as their ‘broad church’ where once they tolerated and even celebrated a membership with vastly differing views. JC – Hugely popular with his adoring fans BUT…. That Jeremy Corbyn has almost God-like status amongst his fans is undeniable. And why not he’s pledged to do many wondrous things that few people could argue with. He’s going to save the NHS with massive injections of cash. Save our railways with nationalisation and massive injections of cash. Save students with no more student loans/tuition fees (despite Labour previously bringing in such loans/tuition fees) and possibly paying off/refunding all the old/outstanding loans/tuition fees too. I could go on but I’m sure you get my and indeed JC’s drift. Does he mean it? Will all his pledges come about if the electorate gives JC a majority at the next election? I’ve been asking such questions of folk I know who are involved in politics and their answers are illuminating. Labour Party members/supporters (excepting the Momentum crowds and JC adorers of course) seem generally downbeat to me. And no, I’ve not been talking to those right wing Labour Party members who some refer to as Red Tories. What Labour members who are sceptical of JC say is generally summed up like this:- We know he will not be able to deliver at least half of what he promises/pledges because there won’t be the money available to any incoming Labour Government to do it. And of course this line is backed up by the present state of the economy following the the financial crash some 10 years ago and the many years of austerity we have suffered. Having said that JC is also going to kill off austerity of course! 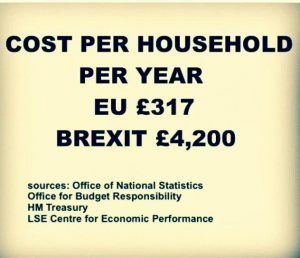 Why only recently it’s been revealed that Brexit, which of course JC is hugely in favour of, will lead to the average household being around £4,000 per year worse off so government revenues will obviously fall, possibly dramatically too. What’s more leaving the Single Market and Customs Union, as JC wants, will in turn mean that to compete the UK will need to slash taxation (and things like the regulations that protect workers rights) so government revenues will be hit hard there too. The question being how will JC deliver his pledges with far, far less money being available to his government? What I am saying is that Labour supporters, who are not wedded to Momentum, see a huge problem brewing for Labour in that it will fail spectacularly to deliver if it gains power at Westminster. Not my words but those of credible Labour people I have spoken to. Wanting to do all the things that we all want doing in our society is very different to being able to deliver them and many Labour members know this. Whilst Iain’s blog posting is predicated on what has happened at Sefton Council meetings the thrust of it fits with what I have heard from within Labour’s tent. Indeed it’s not just me as Roy Connell told me only recently about a chance encounter he had with a senior Labour figure locally who had all sorts of worries about JC’s pledges. I seriously want many of the things JC is pledging to be delivered – A better funded NHS, no more PFI deals to deliver public services, no more tuition fees etc. etc. But economic reality can’t be controlled to deliver enough money into the government’s purse to make wishes come true. 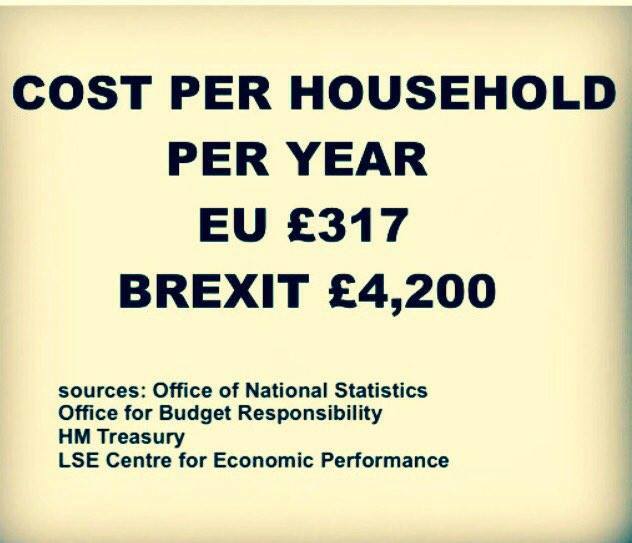 Leaving the EU is not going to make things better economically, its going to make things worse! We will still be living in a global economy no matter how much we pretend to be little Englanders who are unaffected by world issues. Investment in the UK needs stable economics, yet we are heading directly for unstable waters due to Brexit and unrealistic spending pledges by the likes of JC. He may be loved, he may be adored and believed (indeed he may passionately believe that all his pledges are deliverable himself) but that does not mean he can and will deliver when all the pointers say he can’t. As Iain Brodie-Browne points out you can’t just say the new world begins today and everything that was done before it, even by Labour in government, is irrelevant history. It’s not irrelevant because it has put us where we are socially and economically. We might not like where we are, I for one certainly do not, but that does not mean we can change our situation by simply believing another better world is possible. Slamming on the brakes does not stop a massive oil tanker; our economy is like an oil tanker. No matter how much we wish and vote for massive social and economic change it will only happen slowly over many years. Stop the world we want to get off could be the slogan of Brexiters and indeed Momentum but what will actually happen if we pull the wrong leavers is that we stop economically and the rest of the world keeps spinning. JC your world like Brexit is a seriously false and damaging fantasy and there are many in your party who know that. We know you have been told by Jeremy Corbyn how to vote in Parliament over Brexit and Article 50 Bill but this issue is far bigger than Labour Party loyalty; our fragile economy is at stake and many other things too. Please defy the whips and vote not to trigger Article 50; this is a time to stand up and be counted not to just follow what your Leader tells you to do.